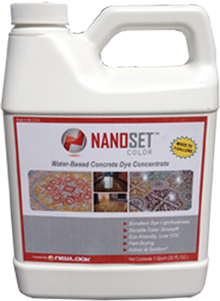 An advanced liquid dye concentrate that adds gorgeous, vibrant colour to interior concrete. The water-based formula is a proprietary blend of penetrating agents that create a durable, fast-drying colour. May be diluted with our Densifier, water or a water-acetone mix to create a range of translucent finishes. Seal with compatible sealers or our hybrid range of hardener/sealers. While our dyes may be used as a colourant for a variety of porous substrates and finishes, it is designed for use as part of our Polishing System. Concentrated colourant highly resistant against alkaline, weather and UV-light. Ecological and anti-allergic properties. Zero VOC (Volatile Organic Compounds) and non-toxic therefore safe to use. An advanced liquid dye concentrate that adds gorgeous, vibrant colour to interior concrete. The water-based formula is a proprietary blend of penetrating agents that create a durable, fast-drying colour. May be diluted with our Densifier, water or a water-acetone mix to create a range of translucent finishes. Seal with compatible sealers or our hybrid range of hardener/sealers. While our dyes may be used as a colourant for a variety of porous substrates and finishes, it is designed for use as part of our Polishing System. Available in kilo and 5 kilo containers. Covers approximately 12 – 18 sq. m. per diluted litre.